Most large galaxies harbor central supermassive black holes with masses equivalent to millions, or even billions, of Suns. Some, like the one in the center of the Milky Way Galaxy, lie quiet. Others, known as quasars, chow down on so much gas they outshine their host galaxies and are even visible across the Universe. Although their brilliant light varies across all wavelengths, it does so randomly — there’s no regularity in the peaks and dips of brightness. Now Matthew Graham from Caltech and his colleagues have found an exception to the rule. Quasar PG 1302-102 shows an unusual repeating light signature that looks like a sinusoidal curve. Astronomers think hidden behind the light are two supermassive black holes in the final phases of a merger — something theoretically predicted but never before seen. If the theory holds, astronomers might be able to witness two black holes en route to a collision of incredible scale. The light curve combines data from two CRTS telescopes (CSS and MLS) with historical data from the LINEAR and ASAS surveys. Image Credit: Graham et al. Graham and his colleagues discovered the unusual quasar on a whim. They were aiming to study quasar variability using the Catalina Real-Time Transient Survey (CRTS), which uses three ground-based telescopes to monitor some 500 million objects strewn across 80 percent of the sky, when 20 or so periodic sources popped up. Of those 20 periodic quasars, PG 1302-102 was the most promising. It had a strong signal that appeared to repeat every five years or so. But what causes the repeating signal? The black holes that power quasars do not emit light. Instead the light originates from the hot accretion disk that feeds the black hole. Orbiting clouds of gas, which are heated and ionized by the disk, also contribute in the form of visible emission lines. So a tight supermassive black hole binary is the most likely explanation for this oddly periodic quasar. But astronomers remain unsure about what physical mechanism is responsible for the quasar’s repeating light signal. It’s possible that one quasar is funneling material from its accretion disk into jets, which are rotating like beams from a lighthouse. Or perhaps a portion of the accretion disk itself is thicker than the rest, causing light to be blocked at certain spots in its orbit. Or maybe the accretion disk is dumping material onto the black hole in a regular fashion, causing periodic bursts of energy. “Even though there are a number of viable physical mechanisms behind the periodicity we’re seeing — either the precessing jet, warped accretion disk or periodic dumping — these are all still fundamentally caused by a close binary system,” said Graham. Astronomers still don’t have a good handle on what happens in the final few light-years of a black hole merger. 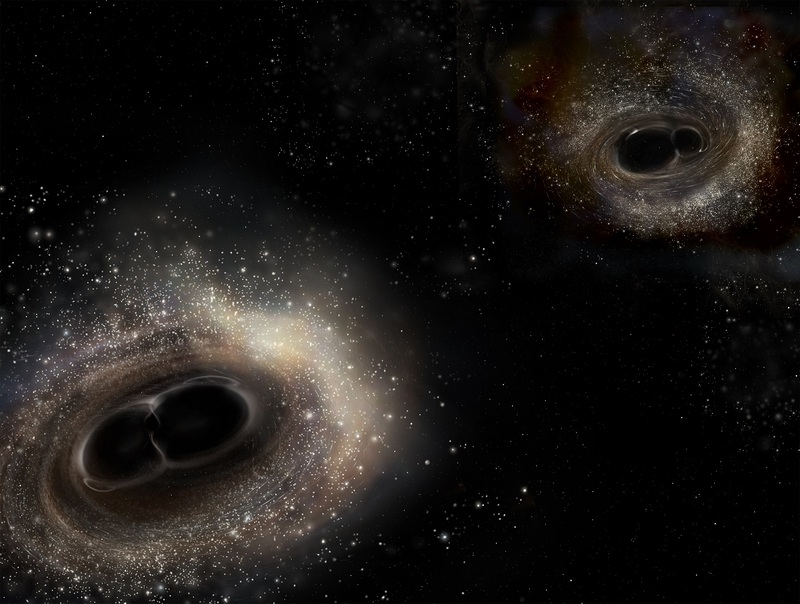 And of course these two black holes still won’t collide for thousands to millions of years. Even watching for the period to shorten as they spiral inward would dwarf human timescales. But the discovery of a system so late in the game proves promising for future work. Why does this galaxy appear to be smiling? The answer might be because it has been holding a secret that astrophysicists have only now just uncovered: there are two — count ‘em – two gigantic black holes inside this nearby galaxy, named Markarian 739 (or NGC 3758), and both are very active. While massive black holes are common, only about one percent of them are considered as active and powerful – called active galactic nuclei (AGN). Binary AGN are rarer still: Markarian 739 is only the second identified within half a billion light-years from Earth. Markarian 739 is actually a pair of merging galaxies. For decades, astronomers have known that the eastern nucleus of Markarian 739 contains a black hole that is actively accreting matter and generating an exceptional amount of energy. Now, data from the Swift satellite along with the Chandra X-ray Observatory Swift has revealed an AGN in the western half as well. This makes the galaxy one of the nearest and clearest cases of a binary AGN. The galaxy is 425 million light-years away from Earth. Since 2004, the Burst Alert Telescope (BAT) aboard Swift has been mapping high-energy X-ray sources all around the sky. The survey is sensitive to AGN up to 650 million light-years away and has uncovered dozens of previously unrecognized systems. Michael Koss, the lead author of this study, from NASA’s Goddard Space Flight Center and UMCP, did follow-up studies of the BAT mapping and he and his colleagues published a paper in 2010 that revealed that about a quarter of the Swift BAT AGN were either interacting or in close pairs, with perhaps 60 percent of them poised to merge in another billion years. Swift’s BAT instrument is scanning one-tenth of the sky at any given moment, its X-ray survey growing more sensitive every year as its exposure increases. Where Swift’s BAT provided a wide-angle view, the X-ray telescope aboard the Chandra X-ray Observatory acted like a zoom lens and resolved details a hundred times smaller. The distance separating the two black holes is about 11,000 light-years , or about a third of the distance separating the solar system from the center of our own galaxy. The dual AGN of Markarian 739 is the second-closest known, both in terms of distance from one another and distance from Earth. However, another galaxy known as NGC 6240 holds both records.